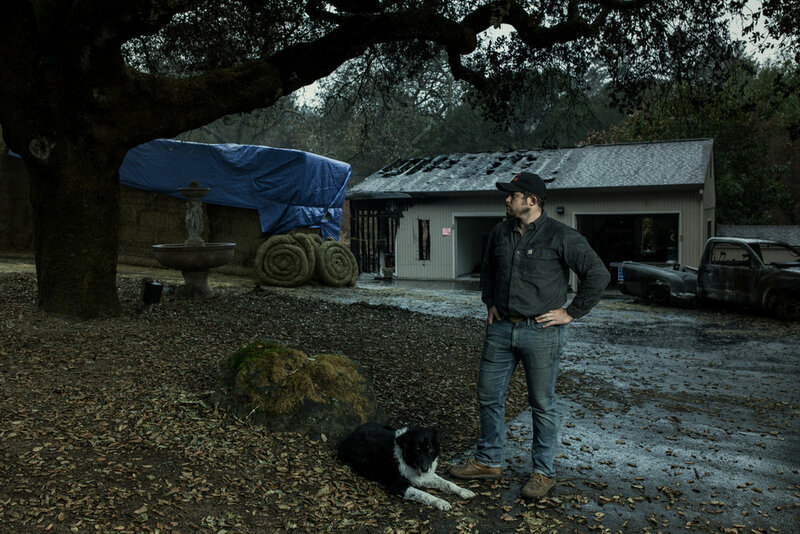 After the fire, Chris Grabill used his experience as a general contractor to help people navigate the process of debris removal and toxic remediation on their land. I'm transitioning to doing full time watershed protection work for anybody who's lost or been affected by the fires. For anybody in the burn zone we offer free land remediation [and] toxic containment on their property. Because I'm on the city board of public utilities, I could go to the watershed task force and say, "Hey, we need to ramp this up. It's urgent.” So, we mobilized pretty quickly and coordinated all the different agencies. I would go out and talk to property owners. And if there was something really urgent, I could elevate it to CalFire, Fish and Wildlife, or the California Office of Emergency Services. Straw wattles are intended to filter sediments so they let fluid through. You can have rain coming down the hillside and [the wattles] let water through without fine sediments, carbon, or potentially toxic contaminants like heavy metals or hydrocarbons. You can secure those within a burn site so it doesn't enter a creek, waterway, or a drinking water source. We needed probably a million feet of straw rolls, at minimum. And it wasn't clear where we were gonna get it, how much it was gonna cost, or who was going to pay for it. So I just talked to the supplier. Then we went to the water board and got funding and just started deploying the logistical mechanisms to get everything out there. The private sector has been really helpful — everybody from Doug [Allard] of The Wattle Guys to Friedman's Home Improvement. We supply them with free straw wattle and they give [them] to anybody who comes to the store from the burn zone. We knew from Paul Stamets' work on bio- and myco-remediation that if we could add mushroom mycelium to a straw wattle, we might sequester more heavy metals. We don't know how effective it will be, but we know that there's a chance it could do more to keep the water clean. So we started putting strategic placements of mushroom mycelium in substrates around the sites that I thought might contain the highest concentrations of things like lead. The relationship of residents to the natural landscape— whether it's through food production or recreation or the recognition of the tie you have to the place you call home — when that changes substantially, it’s a lot. And potentially could be even more [traumatic] if we weren't doing all these things. This is going to be a twenty-year recovery because of all the trees we lost. Southern California has gone through lot of really massive tragic landslides. We could be facing those in ten years too. [Without forests], you start to get these waves of real risk of landslides and hillsides just moving and sloughing away because the root structures that were keeping everything together are just not there anymore. We have 3000 volunteers now using our grassroots website: www.sonomacounty.recovers.org. The permanent displacement of our community, that's what would be the biggest disaster. If everybody moved because they couldn't find a place to live. That's always on my mind. And I know it's on [county supervisor] James Gore's mind and [mayor] Chris Coursey’s and other folks. I think the biggest task is maintaining the spirit of mutual aid and hope and knowing that emergency response work doesn't end when the disaster's over. You have to be there for people long term. And celebrate things that can at least give people a good quality of life. This crisis has convinced me again that [community] is a basic need. It can't just be food and shelter. It has to include expression and music and art, and celebrating, gathering, and eating together!